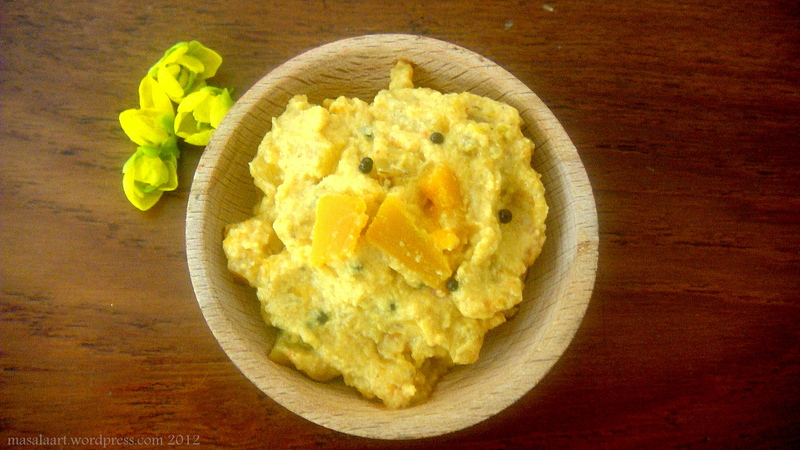 From My Kerala Kitchen: Pineapple Pachadi. Last week I was on vacation in Kerala. Somewhere between sunny and rainy, with the monsoon on it’s way out, it was beautiful. We attended a wedding, which was also beautiful, and I gobbled up a traditional banana leaf sadhya or wedding feast. b) How good the sadhya was. Rice and lentils are at the centre of the banana leaf sadhya, with neyyum parripum (mung lentils cooked with turmeric and ghee) and sambar being served along with the rice. The accompanying dishes, condiments and pickles are portioned onto the banana leaf before hand, with servers coming round to offer seconds as the meal progresses. Sadhyas differ from region to region, but they will always contain avial, thoran, kootu curry, kaalan, stew and pachadi. Pachadis, I feel, are equal parts chutney, salad and curry. They consist of vegetables or fruit which are cooked in a spicy coconut and yogurt sauce, tempered with mustard seeds and curry leaves. And my absolute favourite kind of pachadi, since forever, has been the sweet and tangy pineapple pachadi. I always ask for seconds, and make sure I get a big spoonful. I actually ask for smaller portions of sambar as I’m being served, because I would much rather eat my rice with pineapple pachadi. The dish, when you break it down, is simple: cooked pineapple tossed in a sauce of grated coconut, spices and yogurt and tempered with curry leaves. It’s sweet, big on texture, and bursts with flavour: sweet pineapples, tangy yogurt, smoky mustard seeds and fragrant curry leaves. Some pineapple pachadis also have purple grapes in them, which gives an extra sweetness and juiciness, and I’ve always found the bleeding colours of the grapes pretty to look at. Since Monday is the Kerala harvest festival Onam, I thought now would be a good time to share a traditional recipe! Heat water in a saucepan. When it begins to boil, add the pineapple pieces, turmeric, chilli powder and salt and cook for a 3-4 minutes. Drain. Grind the coconut, half the mustard seeds and green chilli to make a smooth paste. Heat some coconut oil in a frying pan and fry the coconut-spice paste for 2 minutes. Then, add the pineapple mixture and stir well to coat evenly. Pull the mixture off the heat and stir in the yogurt, till everything is evenly combined. Next, get to work on the tempering. In a small saucepan, heat the oil. When the oil is hot, add the remaining mustard seeds and allow them to pop, then add the curry leaves. Pour this over the pineapple mixture and serve. This looks delightful and I can see why it’s your favourite. How much jewellery does the bride usually wear? With Onam around the corner I’ve got Kerala on my mind! Nice post! Lovely recipe! How long does the Pachadi last with refrigeration ? This looks delicious! I love seeing the more unusual recipes on your site.